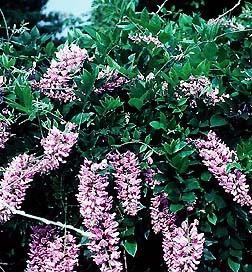 Wisteria sinensis or the purple flowering wisteria is a fast growing vine used to grow on trellises and arbors. Can be trained into tree-form. The flowers are about one inch long, in late May, borne in dense, 6 to 12 inch long racemens. The standard seen on estate trellises. Shipped bare root 6-12'' at time of shipping.